SPC started the day out with an enhanced risk in North Central Kansas with a 10% hatched risk area for tornadoes. Mid 60°F dewpoints were expected to stream north into Kansas and create a modestly unstable atmosphere east of a dryline while a 60kt jet streak at 500mb was expected to overspread the area by 0z. Since I was working for half the day, the southern target was going to be out of reach for me, so I opted to play in northern Kansas, originally heading towards Hays, and hope I could catch something discrete to the north near the triple point. I left work at 19z and began the trek south. I wasn’t expecting initiation until 22 or 23z so I figured I’d have time, but storms began to fire before 20z south of Hays. 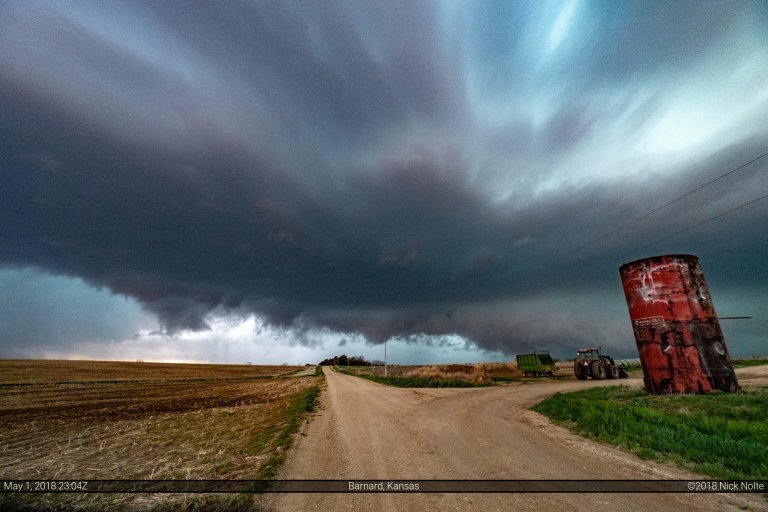 I didn’t cross into Kansas until 2020z, so I was way behind the 8-ball for chasing this day. 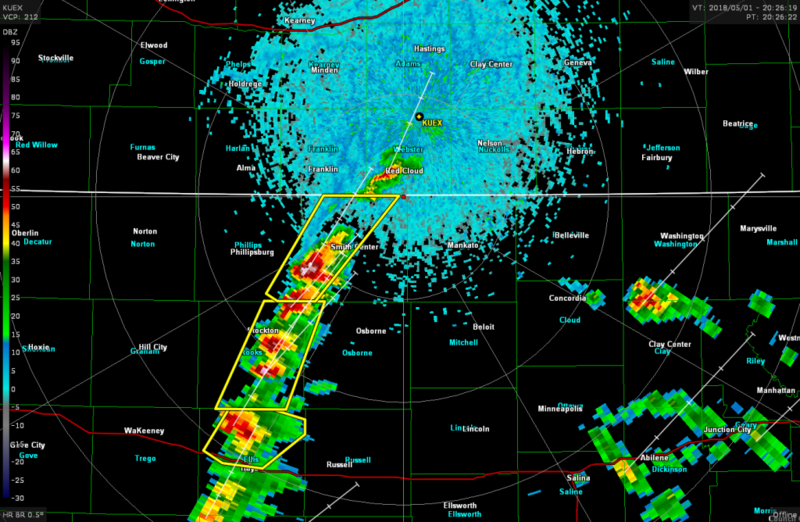 By the time I crossed the state line, several cells had already initiated along a line from Red Cloud, NE to Dodge City, KS. Given the quick explosion of several cells in a line, I picked one to investigate and pulled off the main highway north of Lebanon just prior to 21z. There was a lowering on the base and quite a bit of precip in the foward flank, but nothing too exciting for the time being. Looking north and south the other cells were clearly visible with dense rain shafts intermittently along the horizon. It looked like this event was going upscale really quick, so I wasn’t anticipating anything significant. I decided to stick with this cell since it had the best looking core of the bunch and right after 21z a tornado warning was issued for it. I couldn’t see anything on the ground, so I just assumed it was warning for radar indicated rotation. I continued to follow along, staying just outside the forward flank precipitation to maintain a visual into the inflow notch. Other storms to the south continued to strengthen and impinge on my cell. As 22z approached, velocity signatures indicated a brief attempt at rotation as cells merged, but I never got a visual on anything below the storm. Ironically, while all this was going on, several tornado warnings were in effect around the Grand Island area, including EF-0s between Grand Island and Aurora, and another down near Doniphan, all within a short drive of my house. As the original storm I was on became a huge blobby mess as multiple storms congealed into a mess and began to bow out, I bailed east and south passing through Mankato and Beloit. I stopped about 12 miles south of Beloit to check out the next cell down the line that had separation between it and the other storms. 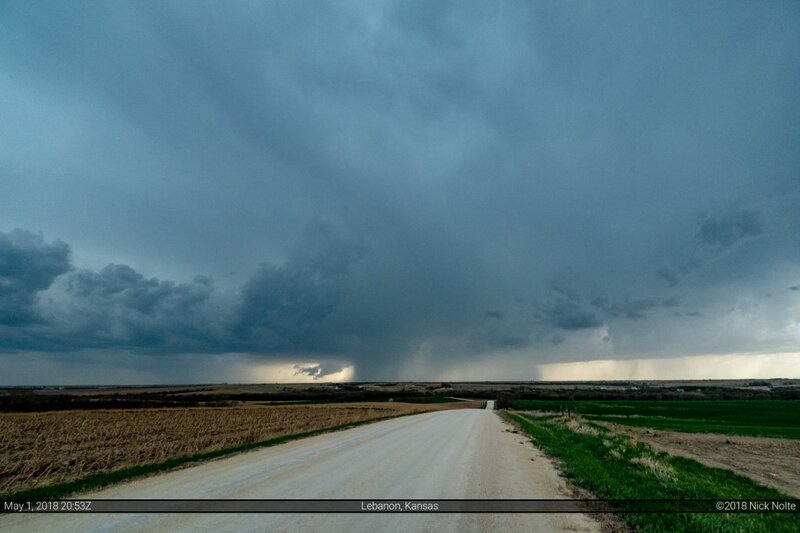 Once I got a visual on it, it had a very large and well defined wall cloud. 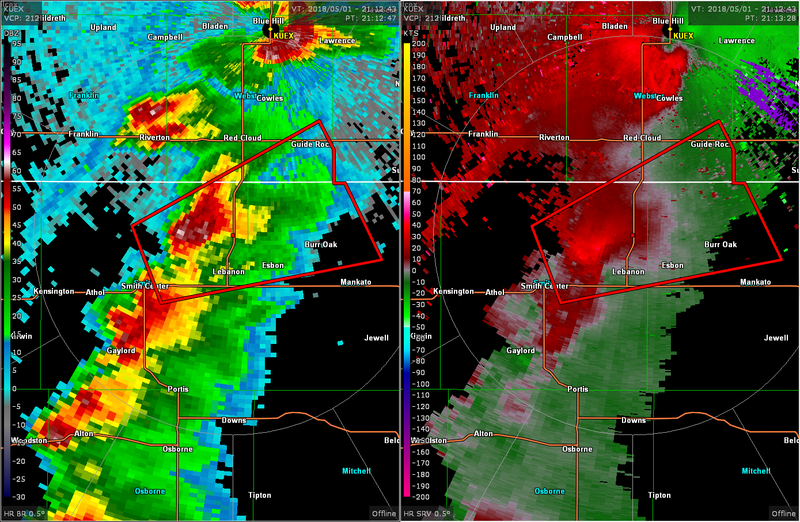 The storm became tornado warned around this time and did put down what appeared to be a brief tornado around 2308z. I followed along with the storm until sunset without it exhibiting any additional tornadic features, while it continued to look relatively impressive on radar. At Clay Center around 1z, I called it a chase and began the trek home.